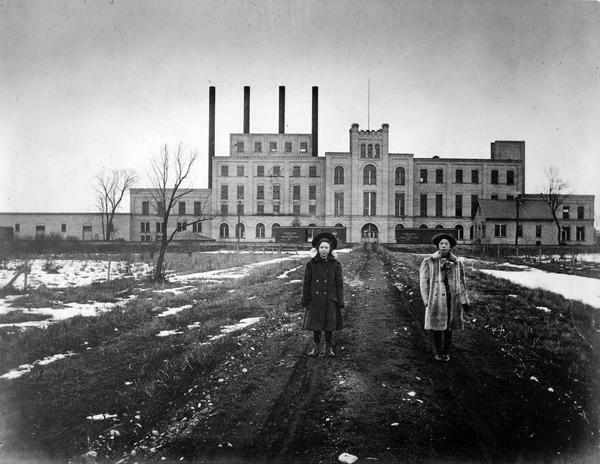 Two women standing on path in front of the Garver Feed Mill, which was originally a sugar beet processing factory. See also Image ID: 113749 for a rephotographed version of this image. The sugar company operated as such from 1906 until 1924. In 1929, James Russell Garver purchased the property to be used as general storage and also for the sale and distribution of dairy and poultry feed. The property was transformed into a mill and called Wisconsin Sales and Storage Company. After James Garver's death, it was sold and the name was changed to Garver Feed and Supply Company.